After visiting Uluru only three years ago, we never thought we’d be back so soon. But we somehow came across information on this ‘Field of Light’ installation and it was something we didn’t want to miss, so we detoured via Uluru on our way home! The Field of Light art installation is a global phenomenon by internationally acclaimed artist Bruce Munro. He has done this in numerous places across the world, but it was a visit to Uluru in 1992 that inspired him to undertake it, so it’s only fitting that it’s now on display at Uluru. It really is such an amazing sight to see, more than 50,000 slender stems crowned with frosted-glass spheres that appear to bloom as darkness falls. Taking a walk through the dainty colourful lights under a sky full of stars at such a spiritual place is like nothing else we have ever experienced. The installation is named Tili Wiru Tjuta Nyakutjaku by the local community and this means ‘looking at lots of beautiful lights’ in local Pitjantjatjara language and that’s exactly what this installation is all about. There are numerous packages available to look at the lights, ranging from viewing from above on a dune, walking around amongst the lights, sunset viewing etc. We chose the ‘A Night at Field of Light’ experience. Yes it wasn’t cheap, but it was an experience we won’t undertake again and we like to make the most of the locations we are in and immerse ourselves into the surroundings. 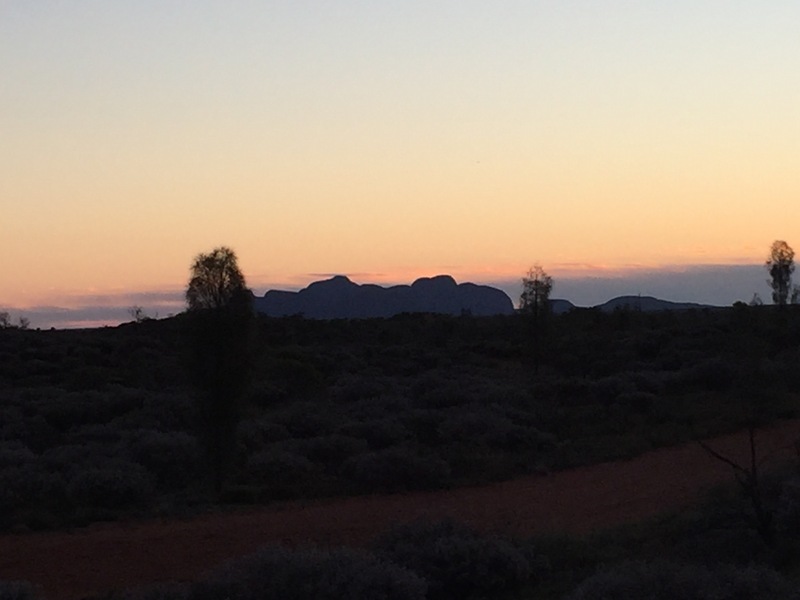 Our ‘A Night at Field of Light’ experience began with us being picked up from the caravan park at 5.40pm and driven to a remote desert location with unbelievable views of Uluru, which would have been about 15km away. We were led from the bus up onto the dune to watch the sunset with a glass of sparkling wine and beautiful canapés of Kangaroo and bush tomato crostini, Balsamic roasted onion and Australian feta filo cup, Paperbark smoked crocodile frittata & Poached prawn, native finger lime. 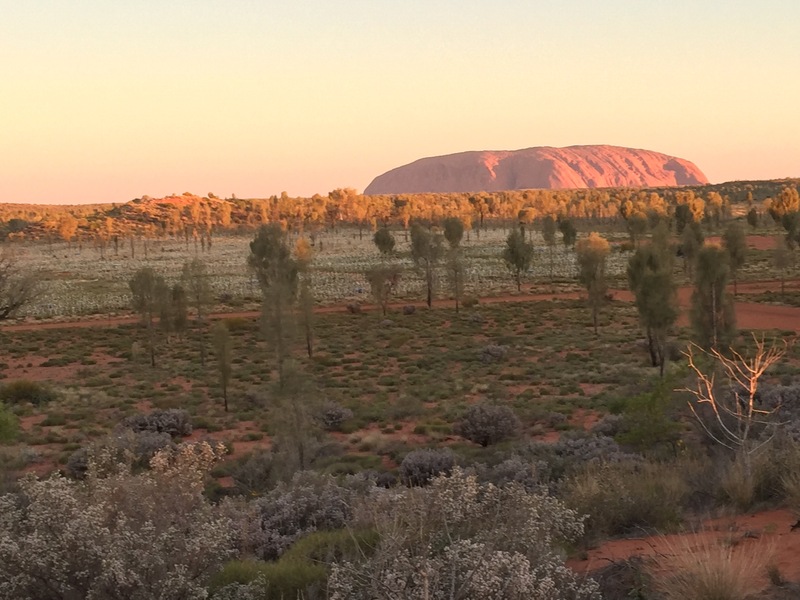 Watching the sun set over Kata Tjuta and seeing the colours changing on Uluru is a sight we were more than happy to experience again ….. on our last visit we experienced this from atop of a camel! Just as darkness fell we were led to another area where our tables were set up for dinner and as we sat down we were served an entre of Pumpkin and lemon myrtle soup, which was amazing and I don’t even like pumpkin! By now the coloured lights were starting to come to life and it was truly a sight to see. We could look down over the field of lights as they started to sparkle and change colour in the night sky. Dinner was a buffet of the following:- Moroccan chickpea salad, Rigatoni and bush tomato pasta salad, Garden salad, Chilled prawns, Smoked salmon platters, Native thyme roasted beef porterhouse medallions, roasted root vegetables, red wine jus, Dukkha seared kangaroo loin on Quandong cous cous, native mint yoghurt, Atlantic Salmon on bok choy and seasonal greens, creamy lemon myrtle sauce, Mushroom and Warrigal Green Risoni & Glazed seasonal vegetables. By the time dessert arrived we were all full from dinner, but managed to fit in a little! Dessert was also a buffet of Warm flourless chocolate and wattleseed slice, Warm pear and lemon myrtle pudding, Desert lime curd tartlet, Davidson plum baked cheesecake & Seasonal fruit platter. Of course all of this was topped off with tea/coffee/hot chocolate and a glass of port. 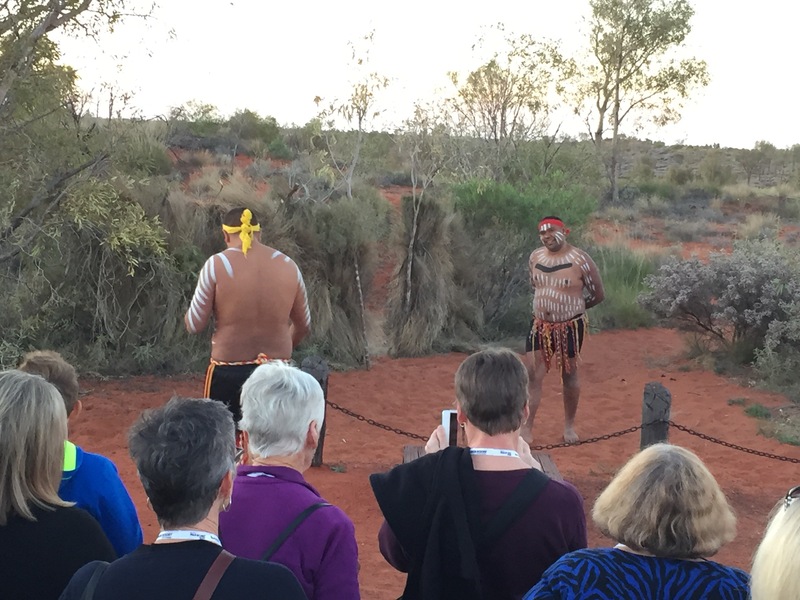 During the meal we were also treated to Aboriginal dancers, a didgeridoo performance and an informative talk on the stars and the night sky. We couldn’t fault the meal, the entertainment or the staff. After dinner it was time to take a walk down amongst the lights. We can’t explain what this was like and no photos can do it justice, it was just beautiful. The lights changed colour from red to blue to yellow and other colours in between, we understand that Bruce Munro had tried to capture the vibrant, rustic colours of the Australian outback and Uluru. As we walked along set pathways between the lights, it was almost a magical experience. After about 20 minutes or so of exploring the lights, we made our way back to the coaches to drive us back to our accommodation. What an amazing night full of great food, great company, laughs and just an overall amazing experience. The art installation is on display at Uluru for 12 months and closes on 31st March 2017. Definitely worth a visit if you are in the area or looking for a mini holiday. 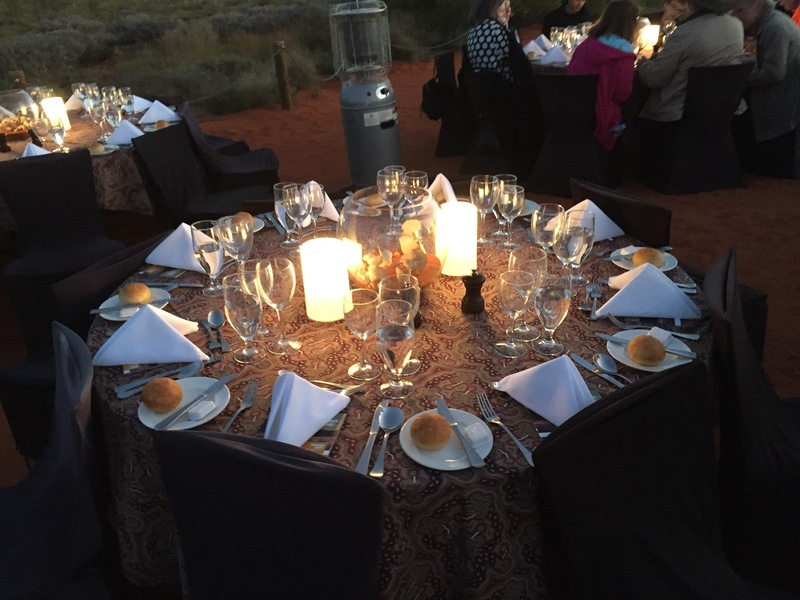 This entry was posted in George&ShellyWAAdventures2016 and tagged A Night at Field of Light, Ayers Rock, Bruce Munro, Field of Light, Uluru by Off The Track 4x4. Bookmark the permalink.